Country Square Western Wear is the one-stop shop for all the men and boys looking for western boots in the Edgewood, WA area. Since opening the store in 1986, we have grown to be the recognized western wear specialists and the most trusted source in the region for cowboy boots for all occasions. We offer cowboy boots for Edgewood residents to meet all needs. We offer high-quality, well-made, stylish and comfortable boots from a variety of manufacturers. 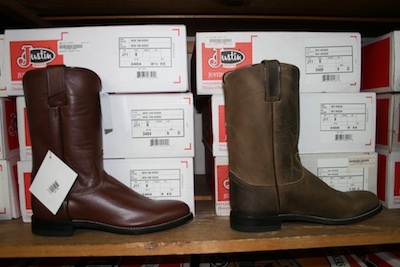 Our boots range in a variety of prices so you can find the cowboy boots you want within your budget. We believe that when our customers are looking for cowgirl boots they deserve only the best. That is why we provide them with only the finest brands in cowgirl boots. We offer beautifully designed, expertly crafted, highly durable and easy-to-wear cowgirl boots from leading names like Ariat, Tony Lama, Corral, Justin, and Durango. Being a customer service oriented business, we guarantee 100% satisfaction for all who buy cowboy boots and cowgirl boots at Country Square Western Wear. Our store offers an unbelievable variety of products for its customers to choose from and stocks the largest selection of western boots in the Edgewood area. When it is time to buy cowboy boots or cowgirl boots, Edgewood residents need to look no further than Country Square Western Wear. Call 253-220-7674.